Surgical Treatment of Epilepsy webinar with Dr. Brian Dlouhy, MD. Click here to view. 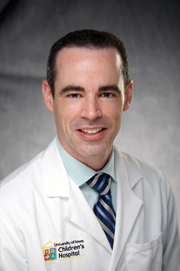 Dr. Brian J. Dlouhy is a pediatric and adult neurosurgeon-scientist at the University of Iowa Hospitals & Clinics in Iowa City, Iowa. He completed his neurosurgery residency at the University of Iowa working extensively under Dr. Arnold Menezes, a pioneer and international leader in pediatric neurosurgery. During his residency, Dr. Dlouhy completed a post-doctoral research and clinical fellowship in epilepsy. Dr. Dlouhy further enhanced his training by completing a fellowship in minimally invasive neurosurgery in Sydney, Australia with world renowned neurosurgeon and neuroendoscopic pioneer Charlie Teo. After returning from Australia, Dr. Dlouhy completed a pediatric neurosurgery fellowship at Washington University and St. Louis Children’s Hospital focusing on pediatric epilepsy. Dr. Dlouhy’s basic science and translational research lab focuses on understanding the mechanisms of sudden unexpected death in epilepsy (SUDEP). This research combines studying patients with epilepsy and animal models of epilepsy to investigate how breathing is inhibited during seizures. Dr. Dlouhy and collaborating labs at the University of Iowa have authored multiple papers recently that suggest seizure spread to areas of the brain such as the amygdala inhibit breathing during seizures and is likely the inciting event leading to cardiorespiratory failure and SUDEP. This research will likely be fundamental in our understanding and prevention of SUDEP in the future. Dietary Therapies for Epilepsy webinar with Stephanie Borst. Click here to view. A Review of diet therapies for epilepsy. The program will cover the basics of each diet and how to safely monitor patients on these diets. 2016 University of Iowa Epilepsy Symposium. Click here to view a podcast of this symposium. What is a Level 4 Epilepsy Center and what is it’s role?